We get that changing behaviour isn’t easy. This isn't about overhauling your life — instead, look for little tweaks that you can fit in to your daily routines. How you #MakeYourDayHarder is up to you. But whatever you decide, make sure to share it with friends, family, and even complete strangers to help grow the MOVEment! It’s not just one big change that will do it all. Think about how your environment pushes you towards certain choices and how you can nudge yourself to make healthy habits easier to do. It's not about perfection. The aim is consistency. Try for healthy choices about 80% of the time then feel free to go with the flow the other 20%. You’re not the only one! 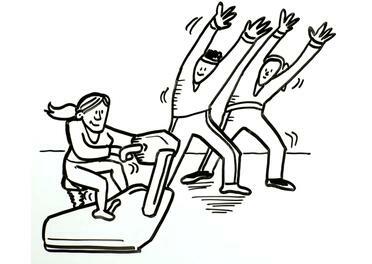 We can all benefit from moving a bit more and we all have excuses and barriers. Sharing tips and tricks and learning from others can be motivating and rewarding. 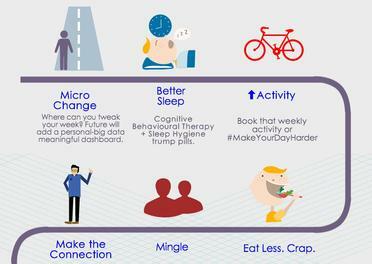 Our #makeyourdayharder campaign focuses on those tweaks and nudges that you build into your routine to increase your physical activity. But it's important to consider the big picture too. Health and wellness doesn't depend on one behaviour. The idea is that starting small and making micro-changes in one area of your life can have an effect on a lot of other behaviours too. We're going for a health cascade! Find out more about the health cascade on the Evans Health Lab website. On the University of Alberta Healthy U site, find out more about the differences between Physical Activity and Exercise and which one is best suited for you. This site also has more ways you can overcome your barriers to become a more active you. We are patients, doctors, designers, film-makers, an Olympian — we’re people who want to find ways to engage whole communities to move more! We fuse clinicians and creatives, filmmakers and patients, social entrepreneurs and best evidence to create “edutaining” information in healthcare. Let’s discuss your upcoming health project. Successful solutions rely on great user experience design. We use research & design thinking to strengthen connections between people, services and organizations. Want to make your day EVEN harder? Did you know in 2011, Doc Mike told us about the single best medicine for your health. Can you guess what it is? Coupled with the #makeyourdayharder movement, a ½ hour of exercise a day can reduce your risk of dementia, diabetes, heart disease, and other chronic conditions. The links on this site are being provided as a convenience and for informational purposes only; they do not constitute an endorsement or an approval by Evans Health Lab of any of the products, services or opinions of the corporation or organization or individual. Evans Health Lab bears no responsibility for the accuracy, legality or content of the external site or for that of subsequent links. Contact the external site for answers to questions regarding its content.